Reading by Lightning by Joan Thomas, published by Goose Lane Editions, made its way into my mailbox from Mini Book Expo. It’s a coming of age novel at a time that the world is on the brink of World War II, particularly in England. It took me a long while to get into this book, more than 100 pages, which was disheartening. In Book One readers will wander through Lily Piper’s musings and her interactions or lack thereof with her parents. The wavering narrative and tangents of Lily drag on for long stretches, and readers may have a hard time following along. Her relationship with her mother is cantankerous at times and Lily is often portrayed as a wayward child led by the sin in her heart. There are a number of instances where Lily wanders off with boys alone, which in many ways should ruin her reputation. Her relationship with her father is more of silent understanding, but again this relationship is not something a girl can cling to when she needs reassurance or strength. Lily’s interactions with her brother are few and not enlightening at all, revealing little of her character or his. Through side stories and discussions about her father’s immigration to Canada and the Barr Colony, Lily learns about her father’s journey, how it came to pass, and the secret illness that prohibits him from leading a normal life. In Book Two, Lily is sent to England to take care of her grandmother, her father’s mother, and this is where the novel picks up in pace and Lily grows into an adolescent and falls in love with her cousin George. Thomas’ writing is detailed and poignant from this point on in the novel and had me riveted. There are passages in these sections that offer suspense and insight into Lily and what she is seeking to learn from her relatives and about herself. However, death seems to follow Lily on her journey and lead her back home to Canada in Book Three. The truest moments in the novel are when the air raid sirens sound and the women and children board themselves up in shelters or in their homes in preparation for war with Germany and when the bombs are falling outside and they huddle in the dark living room comforting one another with stories of the mundane. These scenes are well crafted and tangible for readers, transporting them to another era. Once back in Canada, Lily succumbs to her previous manner in the home of her mother, but the letters from her cousins abroad continue to bring the reality of war home. I read this novel as part of the War Through the Generations: WWII Reading Challenge. This is my first completed book for the challenge. I’ve been a bit slow. 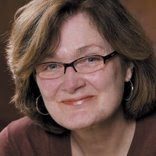 Joan Thomas has been a regular book reviewer for the Globe and Mail for more than a decade. Her essays, stories, and articles have been published in numerous journals and magazines including Prairie Fire, Books in Canada, and the Winnipeg Free Press. She has won a National Magazine Award, co-edited Turn of the Story: Canadian Short Fiction on the Eve of the Millennium, and has served on the editorial boards of Turnstone Press and Prairie Fire Magazine. She lives in Winnipeg. This giveaway will be international. I have one gently used ARC copy of this book available. Leave a comment on this post and randomizer.org will select the winner. Deadline is March 20 at Midnight EST. 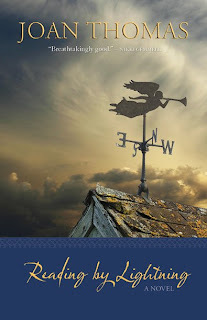 I have two copies up for grabs of Sharon Lathan’s Mr. & Mrs. Darcy: Two Shall Become One; the giveaway is international and the deadline is March 14 at Midnight EST. I received A Grave in the Air by Stephen Henighan from Mini Book Expo for Bloggers, and it took a long time to get to my mailbox from Thistledown Press in Canada. When it finally arrived I was happy to begin reading. I’ve often loved reading novels and short stories that show how war can impact families, relationships, and societies. Although the short stories often do not provide the reader with in-depth war strategy and in-the-moment events, whether it is World War II or the Bosnian-Serbian conflict of the 1990s, the impact of war is palatable in the lives of the characters Henighan created. The book of short stories starts off with “The Killing Past,” which examines the impact of an aunt’s story about a family’s ancestor on her nephew Bartholomew. The obsession it becomes for Bart is phenomenal. In “Miss Why,” Agnieszka is an inquisitive youth growing up in Poland at a time when the nation is moving away from socialism toward more Western ideals. While she struggles to find her place in society, she meets a man with a similar outlook on the Western ideals taking over their society. It was interesting to see how they coped with the transformation of their society, though there really was no resolution in this short story, which left me a bit disappointed. “Duty Calls” follows Tibor, who is recently divorced, and his relationship with a woman he has not seen in many years and his disillusionment with himself since his divorce. This story is not very uplifting, but it does deal with how a man, who sees himself as an outsider, will act to gain acceptance. In “Beyond Bliss,” which was my favorite of the short stories, Vivian compromises her integrity to get what she wants. To help her friend, Ray, build his publishing house in Canada, she gains the trust of Erich, a controversial author. Vivian, another character who feels like an outsider in Canada because she is British, uses her ambition to find her place in the world. I also really enjoyed “A Sense of Time,” “Freedom Square,” and “Nothing Wishes to Be Different” because they show the reader a series of relationships that change between former students at university because of a single event, a relationship between a mother and daughter because of the daughter’s summer job, and the relationships between a father and mother and their children when the father makes one fateful and personal decision about his own life. While this is not one of my favorite short story collections, it does have a great deal going for it. It examines how war in the present and past can have an impact on someone, even if they are not directly involved in a conflict. Some of the characters are quirky and bit out there, but others are carefully nuanced. 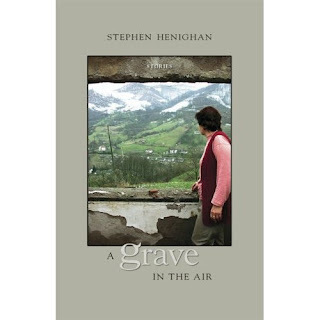 Dear Readers, I would love to give away my copy of A Grave in the Air by Stephen Henighan to one lucky winner. Please leave a comment here if you wish to enter the contest. Deadline is Oct. 10 at Midnight EST. I will announce the winner on Oct. 11. If you blog about this contest, you get 2 more entries. Ray Riegert’s Hidden Hawaii published by Ulysses Press incorporates full-bleed photos ranging from the Pacific Ocean to lava flows on the outside and inside of the book. I claimed this travel guide from the Mini Book Expo for Bloggers because my husband and I have been talking about a vacation to Hawaii since before we got married six years ago. Ideally, that would have been our honeymoon of choice, but money was unavailable at the time for that kind of vacation, so we went somewhere closer for our honeymoon–Jamaica. Now that we are older and wiser and are willing to plan ahead, we are looking toward our goal, Hawaii, and hopefully, Kauai. This travel guide is larger than I would like to take along with me on the streets as a handbook for exploration, but then again I carry a large SLR and other photographic equipment. However, this book does have a lot to offer tourists interested in a trip to the island chain. The white and green pages provide readers with a crisp, clean page to read, and the contents are broken down by island–Oahu, Big Island, Maui, Lanai, Molokai, and Kauai. One of the best parts of this travel guide is that it not only tells the reader the touristy locations that are “must see,” but also the hidden aspects of the islands. 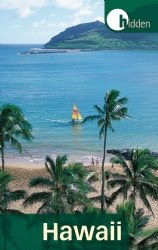 For instance, in Waikiki, one of the most well-known attractions is Diamond Head. One of the hidden treasures of Waikiki highlighted in the book, which peaked my interest, is Queen Kapiolani Hibiscus Garden where tour buses do not have a place to stop, but tourists can spend the day picnicking in splendor. Hidden Hawaii not only describes the major hotel chains in Hawaii, but also some of the smaller hotels and bed and breakfasts. It contains green and white maps broken down by particular regions and various coastlines, which will help tourists orient themselves. Some of the maps outline streets, and many of them are dotted with attractions. I would love to see the Star of the Sea Painted Church on the Big Island for myself, which is another of the hidden treasures that can be found in this book. According to the book, a Belgian priest painted murals of religious scenes inside the church, which reminded me of the Sistine Chapel’s ceiling in Italy painted by Michelangelo. This church must be a sight to see. From outdoor activities like kayaking in the ocean to hiking to tennis, this book has something for everyone, even those just interested in lying on the beaches and getting a suntan. There are favorite tourist night spots and those that are hidden. My husband and I enjoyed looking through the book and picking out the hidden spots and the more well-known spots we would like to see on our trip someday, but we were a bit disappointed that there weren’t too many photos of the islands, the parks, destinations, museums, activities, and the like. All of the photos in the book are at the beginning. If I had to pick a drawback, that would be it. This book is for tourists interested in the hidden side of the islands and the tourist attractions. I would recommend it as a starting guide for a trip to Hawaii.